Today is the first post in my series about Delta Gamma! I get asked frequently if I am affiliated with Delta Gamma due to my anchor obsession. I am not but I know that many of my readers are! I am currently accepting guest posts on Delta Gamma-you experiences, traditions, photos, whatever you would like to share. I would love to highlight different chapters around the country. 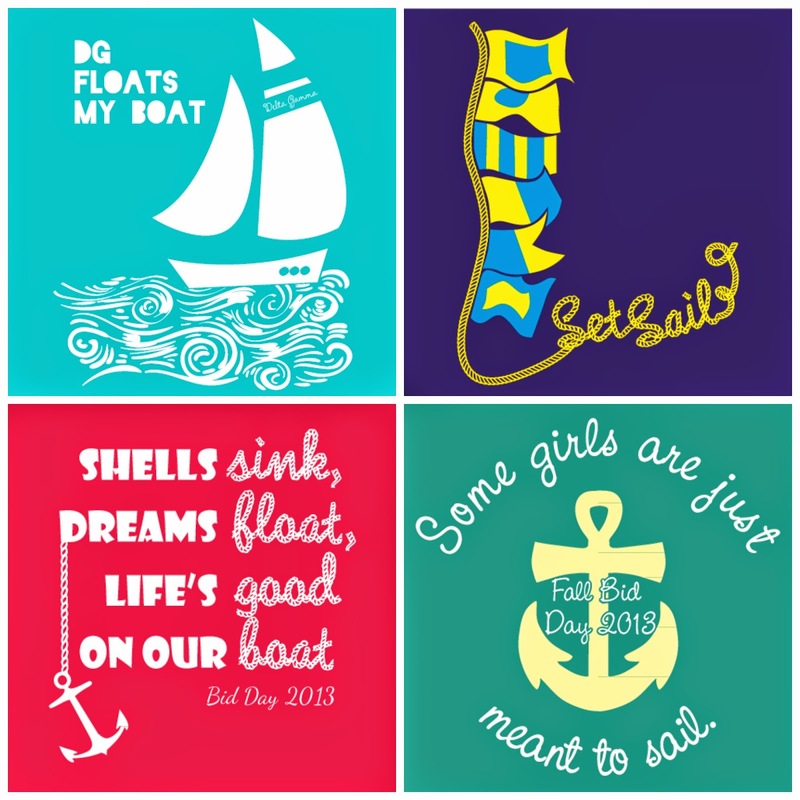 First Things First: What Is Up with Delta Gamma’s Anchor Obsession? Delta Gamma began back in 1873 in Oxford, Miss., founded by Anna Boyd Ellington, Eva Webb Dodd, and Mary Comfort Leonard. Wanting to push for high ideals and to encourage intellectual service, the founders chose the word “hope” as their watchword and the letter H as its corresponding symbol. Four years later, the badge changed to the anchor, which is widely acknowledged as the traditional symbol for hope. Today, the symbol is a blue anchor wound with red ropes (aka a fouled anchor), a beautiful picture of the way fraternity members are entwined together in sisterhood. Delta Gamma’s Mission Statement: In keeping with the theme of hope and high ideals, the fraternity’s mission, as laid out in its public mission statement, is to offer “women of all ages a rich heritage based on principles of personal integrity, personal responsibility, and intellectual honesty. Its primary purpose is to foster high ideals of friendship, promote education and cultural interests, create a true sense of social responsibility, and develop the finest qualities of character.” Delta Gamma follows through on this mission with a wide range of fundraising, community service, and educational opportunities for its members. What Is the History of the Anchor Symbolization? Some of the earliest examples of using the anchor as a symbol were in royalty. The anchor appeared as the royal emblem of Seleucus the First, king of the Seleucid dynasty established after Alexander the Great’s campaigns, reportedly because he had a birthmark in a similar shape. Jews under this king’s reign adopted the symbol, but they later phased it out around 100 B.C. Then, Christians began using the anchor during persecution, possibly as a symbol of anchoring hope in future existence, but they stopped by 300 A.D., switching to the cross instead. Later, in the 1600s, the anchor reappeared as a symbol engraved on tombs. Why Is the Anchor Important? For more than 15,000 Delta Gamma collegians and over 145,000 living Delta Gamma alumnae, the anchor has become a symbol of everything the fraternity stands for — hope, responsibility, and high standards. As the most widely recognized symbol of the Delta Gamma Fraternity, it’s also an identifier for members, linking them with thousands of others in the sisterhood. How Are Anchors Used Today? • Anchor Games®: Delta Gamma’s fundraising events, held on campuses across North America, fall under this all-encompassing term. From Service for Sight to scholarships to educational programs, Anchor Games® help raise funds to support Delta Gamma’s programs and philanthropies. • Anchor Splash®: The most popular fundraiser held by Delta Gamma chapters, this event involves various competitions between fraternities and sororities, designed to raise money for specific foundations and charities. • Member Pins: Only initiated Delta Gamma members wear the official badge, and they are the only ones who know the full meaning of the fraternity’s crest. Delta Gamma has come a long way since its founding by a small group of women in Oxford, Miss., more than 100 years ago — but some things haven’t changed. Like its allegiance to hope and the anchor that symbolizes it, Delta Gamma still stands for helping women become their best selves, wherever they are. Erica Wolfe is a proud, active member of Delta Phi Epsilon and a Marketing Associate at Greek Streak – an online Greek apparel retailer providing fraternity and sorority clothing for the Greek community. Love this post! I'm a DG alumna in Canada and I always love reading about my sorority! I can definitely attest to the anchor obsession - I'll buy almost anything if it has an anchor on it! Aren't they cute? There are pages of fun designs!